Today Fulton Mansion would be called the empty-nest home of George W. Fulton and Harriet Gillette Smith since at the time of its construction the Fulton’s six children were already grown. 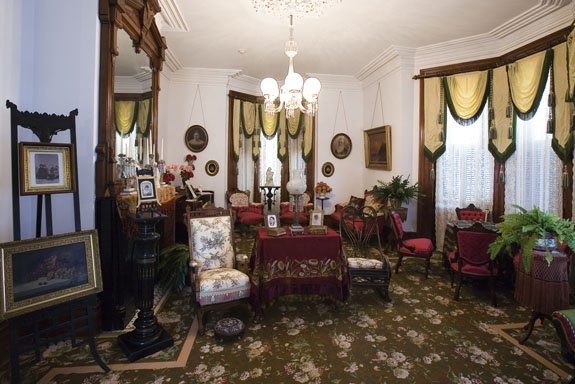 In 1877 when the 3 ½-story, nineteen-room Second Empire style mansion rose along the shore of Aransas Bay, it was grandest house on the Texas coast, and the Fultons, with the help of seven servants, entertained lavishly in their elegant new home. Fulton, like his cousin Robert Fulton of steamboat fame, was a brilliant engineer and used his skills to design a house with features that were rare for that time—hot and cold running water, gas lights, a refrigeration system, central heat, and flush toilets. Despite sitting only yards from Aransas Bay, the Fulton Mansion withstood massive storms, including the 1919 hurricane and ten-foot tidal wave that destroyed most structures in the area. Fulton designed a shellcrete (a form of concrete made from the plentiful local shell) foundation. Walls, both inside and out, were made of one-by-ten-inch pine boards stacked side-by-side to form a solid ten-inch thick frame. Shellcrete filled in between every fourth or fifth board in the floors creating a structure as stable as a grain elevator. Fulton could afford to construct the house, which cost about $l00,000, because of his wife’s inherited land and his own entrepreneurial spirit. Fulton, born in 1810, had worked in Indiana as a schoolteacher, watchmaker, and creator of mathematical instruments until he organized a company to fight in the Texas Revolution. They arrived too late for the action, but Fulton joined the Army of the Republic of Texas in 1837 and for his service received 1,280 acres. Fulton worked for the General Land Office, which introduced him to the legal maneuvering necessary to acquire land. In 1840 he married Harriet who was the daughter of Henry Smith, governor of Texas for a short time in 1835 before the war for independence from Mexico. After Smith failed to win the presidency of the new Republic of Texas, he continued to serve in several government positions, to purchase land along the coast, and to promote the development of his property. Meantime, George Fulton and Harriet left Texas and spent the next twenty years in Ohio and in Baltimore where they raised and educated their children. After Harriet’s father died and the Fulton’s cleared the titles on Smith’s coastal land, they returned to Texas. Using his knowledge of land titles, Fulton purchased acreage, and combined with the land Harriet inherited from her father, Fulton acquired 25,000 acres. After joining with partners in the Coleman-Fulton Pasture Company, the holdings peaked at 265,000 acres, creating one of the largest cattle companies in Texas. The lavish lifestyle that ensued from the business allowed the partners to live like cattle barons and the Fultons to build their grand mansion. 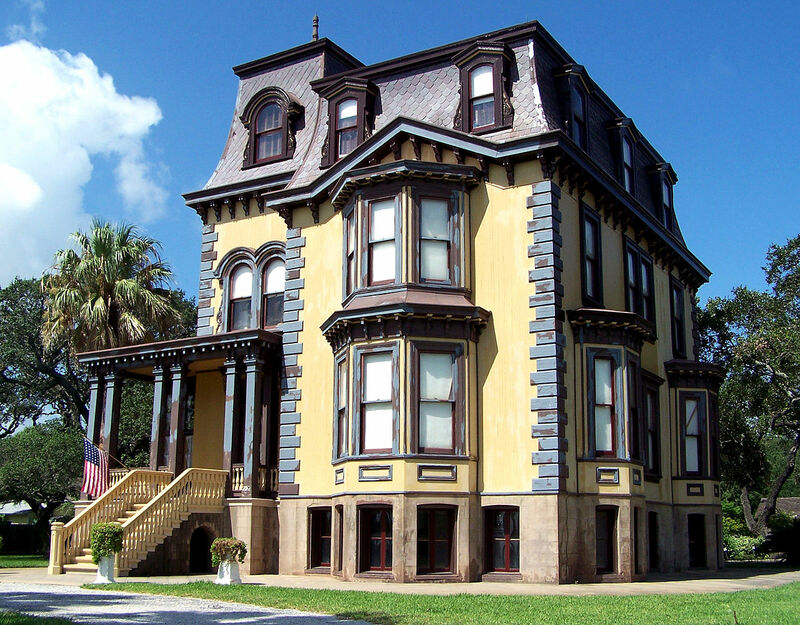 The most elegant of Fulton’s achievements, which survives today, is the Fulton Mansion, listed on the National Register of Historic Places and operated as a house museum by the Texas Historical Commission. A project is currently underway to raise $3.4 million to strengthen and preserve the grand old mansion. In the grand ole manner, Myra, a relic of oul decency. an elegant actress ‘resting’ these buildings have a fascination and you give us the background and the circumstances that made this fine house possible. Thank You. Thank you for taking a look. It’s my pleasure.